Two small Sapphires grace both sides of this dramatic yet simple design. 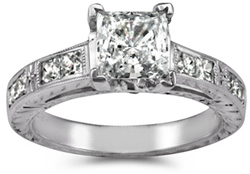 Specifically complements a Round or Square shaped center stone. 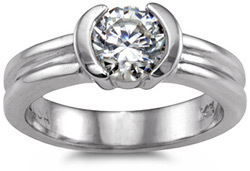 14K White Gold diamond ring can hold a 1-4 carat center diamond. 8 side diamonds complement your choice of center stone - 6.5mm wide. 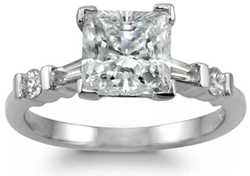 A Princess Cut Diamond lover's delight - 8 side square diamonds in 14K White Gold and 4mm wide. Superb Hand Engraved Detail though can be set with any shape or size stone of your choice. 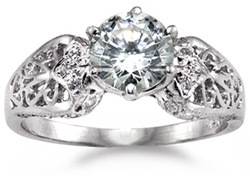 Antique Diamond Ring - Choose any size stone - up to 5 cts. - 6.7mm wide with a six prong setting. Filligree detailing with a bit of pave for fun. 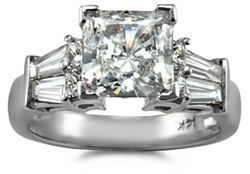 14K White Gold Fancy Solitaire Engagement Ring - This lovely setting loops around one perfect round center cut diamond. At 3.6mm wide it's a substantial ring with real weight to it. 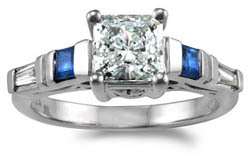 Custom rings can be created from a picture, drawing or an advertisement. To include your picture, link to a picture, or drawing e-mail us directly rings@elsarings.com. Our inspired staff of custom designers will make your dream of owning an ORIGINAL piece of fine diamond jewelry a reality ]> Have an exciting experience being involved with designing your own custom diamond ring.